Across the country, more and more cities and counties are making commitments to achieve racial equity. The Government Alliance on Race and Equity (GARE) is a national network of government working to achieve racial equity and advance opportunity for all. When government focuses on the power and influence of their own institution and works in partnership with others, significant leverage and expansion opportunities emerge, setting the stage for the achievement of racial equity in our communities. Over the past decade, a growing field of practice has emerged. This toolkit is based on the lessons learned from practitioners, as well as academic experts and national technical assistance providers. You may be participating in a structured workshop and using it as a part of the workshop; or you may be using it as a reference. 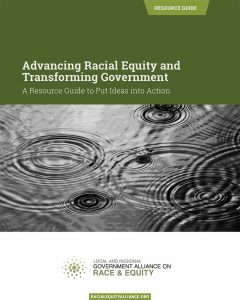 It is a resource that will hopefully be informative, but more importantly, one that we hope will assist government leaders in operationalizing racial equity. We know that is important for us to work together. If your jurisdiction has already initiated work to achieve racial equity, join the cohort of jurisdictions at the forefront. Sharing best practices, peer-to-peer learning, and academic resources helps to strengthen work across jurisdictions. If your jurisdiction is just getting started, consider joining one of the new cohorts GARE is launching, focusing on jurisdictions at that initial stage. The cohort will be supported with a body of practice including racial equity training curricula, infrastructure models, tools, and sample policies. If your jurisdiction needs assistance with racial equity training, racial equity tools, model policies, communications coaching or assistance with particular topic areas, such as criminal justice, jobs, housing, development, health or education, please contact GARE. If you are in a region where there are opportunities to build cross-jurisdictional partnerships with other institutions and communities, GARE can help build regional infrastructure for racial equity.